US-North Korea Summit: Hold the Cheers. Inter-Korean Summit to Precede Trump-Kim Meeting? Ahead of a possible Kim/Trump summit, an April 27 inter-Korean one will be the first since 2007, only the third one since the peninsula was divided post-WW II. Both countries are in talks to formally declare an end to the 1950s war, replacing an uneasy armistice, an important agreement if concluded. It’s unknown if Kim Jong-un and his delegation will walk across the heavily militarized border to meet with South Korea’s Moon Jae-in, a symbolic reconciliation gesture if so – something no North Korean leader ever did since the 1953 armistice. Their summit will be held at Peace House in Panmunjom, on the South Korean side of the border. On Wednesday, Trump said both countries “have my blessing to discuss the end of the war” – a positive sign if he maintains this position, uncertain given how often he says one thing and does another. Reportedly Kim and Moon will release a joint statement, saying they intend to formally end decades of conflict between the North and South. 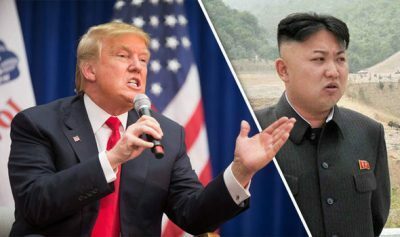 A successful summit would pave the way for Trump to meet Kim – likely in late May or June if occurs, the first ever between leaders of both countries. Major issues need to be resolved, given a state of war between both countries for decades. Weeks earlier, secretary of state designee Mike Pompeo met with Kim in Pyongyang, preparing for a summit with Trump. Denuclearizing the peninsula won’t happen without iron-clad security guarantees for the DPRK, what’s been unattainable throughout the post-WW II period – very risky to do given Washington’s rage for endless wars of aggression against all sovereign independent nations. North Korean officials are mindful of US aggression in Iraq and Libya, nations abandoning WMDs, defenseless except for conventional weapons when attacked by Washington and its imperial partners with overwhelming force. Pyongyang agreed to freeze and replace its nuclear power plant program with a light water nuclear reactor, along with steps toward normalizing relations with Washington. The Clinton administration agreed to build two light-water reactors by 2003. In the interim, it would supply Pyongyang with 500,000 tons of heavy fuel annually. US sanctions would be lifted. The DPRK would be removed from the State Department’s state sponsors of terrorism list. Both countries agreed to provide “formal assurances” against threatened or actual use of nuclear weapons. Pyongyang agreed to allow Washington to monitor its nuclear sites. It upheld its part of the deal – collapsing after GW Bush declared North Korea part of an axis of evil in his first State of the Union address, breaching the agreement unilaterally. US administrations consistently betray sovereign independent countries, why Washington can never be trusted under GOP or undemocratic Dem leadership. Rare exceptions prove the rule, none since the Soviet Union dissolved in 1991. A nuclearized peninsula gives US administrations pause about attacking the DPRK. Abandoning its key deterrent leaves the nation vulnerable. North Korea wants peace, unacceptable sanctions lifted, and normalized relations with the West. Abandoning its most effective defense against possible US aggression may be too great a price to pay – given Washington’s permanent war policy, its rage for global dominance, its longstanding regime change policy against all sovereign independent nations.